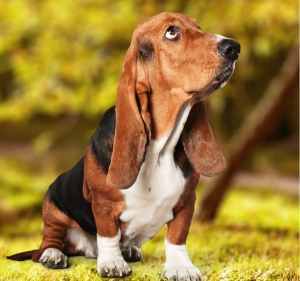 The Basset Hound may just be one of the most placid, gentle dogs in the hound group, with a nose to scent only surpassed by the Bloodhound. A friend to all, but they need a tolerant owner who doesn’t mind a little drool, smell, and shedding. This breed tends to be less reactive to their owners' comments and more understanding of chaotic households. While this is great for large families and having guests over, it can make training a bit difficult. Those that can appreciate their independent personality and their occasional stubbornness will be rewarded with a companion that loyal, great with children and accepting of other dogs. They are, however, sensitive to extreme temperatures. Owners can't let them stay outside for too long if it is too hot or too cold. They are pack dogs and hate when they are not with their families. 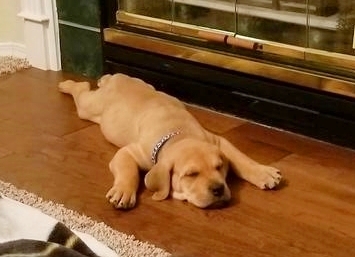 The breed is prone to separation anxiety if left alone for too long. Owners will often send their dogs to day care or hire a dog sitter if they are not home all day. 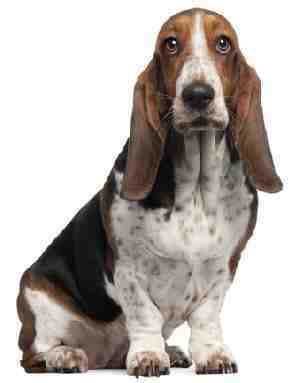 Overall, the Basset Hound is fairly well behaved and laid back dog. They may, however, get into some trouble if left alone or neglected. Some like to let others know about their loneliness by barking and baying while others prefer to chew on their owner’s things or tear up upholstery. Otherwise, they are relaxing household companions, and love to be around their families, even if they are not very outward about it. The Basset Hound is known for being a pretty low maintenance dog. They are not very energetic, making for relatively relaxing company. These dogs aren’t very playful either so their very much needed exercise will have to be initiated by the owner. These qualities make them good apartment dogs, although, their vocalization might make owners want to think twice about introducing them into such an environment. Neighbors don’t tend to be too fond of the loud noises that these dogs can produce. 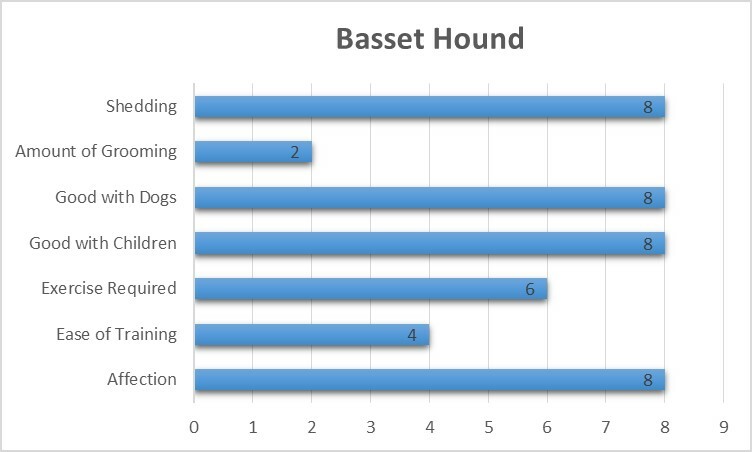 Basset Hounds love to be around other people and are great for owners with children. Their laid back and less sensitive personalities help them to tolerate the chaos that comes with kids. Their size keeps them from injuring smaller children as well. So long as they are taught how to handle the dog right off the bat, kids usually coexist well with this breed. Given their laid back and relaxed personalities, you might not suspect the Basset Hound to be the escape artist it proves to be. Don’t be fooled, though, as these dogs will go after anything they are interested in, even if it takes them into traffic. With a nose second only to the Bloodhound, these dogs will catch scents that they’ll almost always want to investigate to the source. This being said, they need a solid fence when outside to keep them from doing so. Thankfully, their short legs keep them climbing over the fence. As with most breeds, the Basset Hound’s history can be hinted at by its name. The word “bas” meaning “low” in French, its name points out the breed’s size and stature. In France, the breed had been derived from a descendant of the St. Hubert’s Hound. People wanted to capitalize on the dog’s nose as well as height, often using them as hunting dogs. The St. Hubert’s Hound, well known for likely being an ancestor to the Bloodhound as well as the Basset Hound, is likely descendant of an ancient Greek breed. These dogs, known as Laconians, were probably also used as hunting dogs in ancient Greece. It was during the French Revolution that these dogs became especially popular. The food was scarce with the failing government, so a hunting dog that was close to the ground and could work with its owner on foot was ideal. Being a relative of the Bloodhound, these dogs are known for their exceptional noses. Owners would put them to use tracking game, as well as clearing underbrush. These dogs were at first known mostly among the aristocracy in France, but in the 1700s, became a more common and popular dog among all the social classes. Whether it be for hunting or simply being a household companion, Basset Hounds began to get a decent amount of attention at this time. They would continue to rise in popularity in France, seeing special recognition under the reign of Napoleon III. Being in Europe, and in France, it didn’t take long for the rest of the continent to get on board. Soon enough, in the 1870’s, Basset Hounds had made their way to England, where they became very popular as well. The breed once again found its place among the aristocracy as well as the ordinary people. In 1884, the breed had its own kennel club in England, registered by the English Kennel Club. It’s most likely that these dogs had been in the Western Hemisphere for some time, but they became especially noticed in the early 1900s. This was just in time for WW1 to hit Europe, luckily allowing for the breed to remain stable beyond the European continent. Back in Europe, many dog breeds saw their populations threatened by the conflict. This was the case during and after the war, as few could afford to keep pets with the failing economy. WW2 has less of an inpact on the breed, because once the conflict began, these dogs already had a solid base in the world. By this time, in fact, the breed had started to get a growing following in the US. 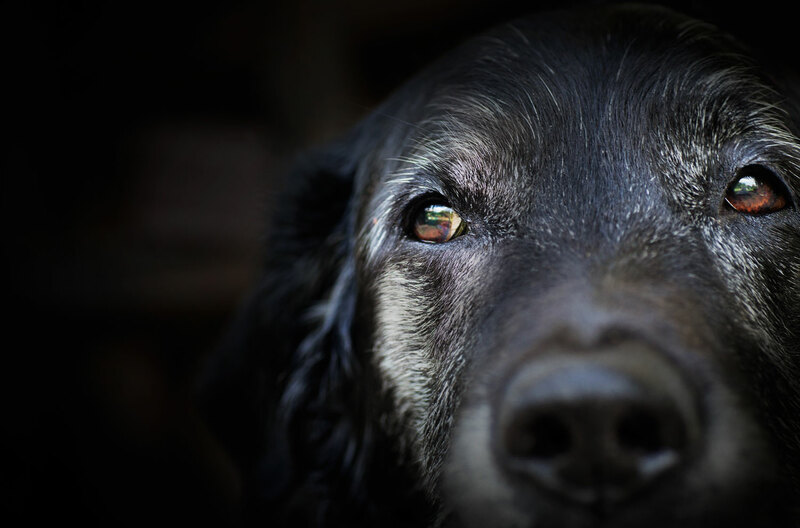 In the years following the war, the breed’s popularity blew up even more, especially once paired with the booming postwar economy. People could now afford the luxury of owning a dog, and jumped on it with the general mood of conspicuous consumerism. The breed was first registered by the AKC in 1935 and has since risen in popularity. Today, the breed holds the ranking as 41st most popular of the breeds registered by the AKC. 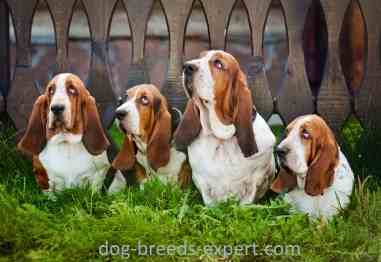 All hounds are known to be relatively difficult to train, the Basset Hound is not an exception. Their low sensitivity paired with the dog’s independent personality makes them less keen on listening to their owners. Their weakness is their appetite, and owners will often persuade these hounds into cooperation with treats. Besides treats, these dogs require owners with a lot of patience and time on their hands to be trained. Their low sensitivity can make these dogs frustrating to train, but harsh reprimands for bad behavior won’t help either. Scolding a dog for doing something wrong will only make it more reluctant to learn. These dogs need consistent, positive reinforcement. Once trained, Basset Hounds are excellent companions, as well as very well behaved. While not incredibly intelligent dogs, they are capable of learning plenty of tricks, so long as rewards of food are involved. Socialization is necessary with any breed. Dogs like the Basset Hound are typically friendly and hospitable towards strangers and guests, so socialization will only make them more comfortable. Exposure to many sights smells and sounds will also make them less vocal when alerted by something. 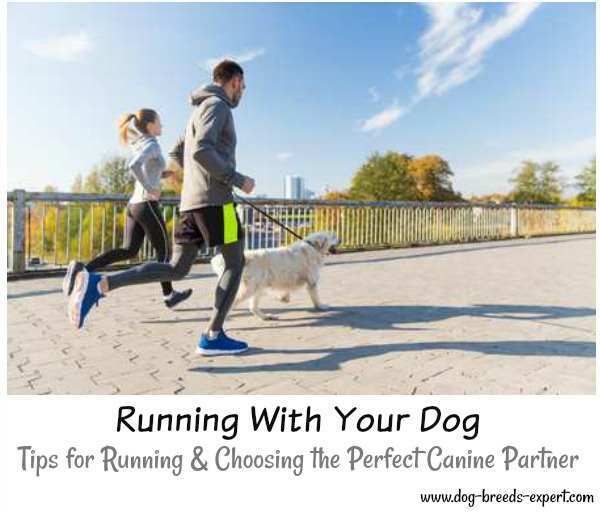 It’s recommended that owners take their dogs on frequent walks early on to help them become accustomed to their environment. Taking a dog to obedience classes can also help it become more social with other canines as well. There are no markings registered by the AKC for the Basset Hound. The Basset Hound does not make for a tough dog to groom. Their stubby legs and body are covered in a compact, short coat. This coat wicks off water and typically keeps them reasonably clean. It’s recommended that they are brushed weekly to help distribute oils and remove dead hair. Otherwise, these dogs do not get too dirty, and typically only need to be bathed as needed. 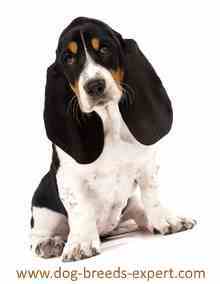 The Basset Hound carries a pair of large, floppy ears that cover their ear canals. This prevents them from getting too much airflow in them, allowing for bacteria and anything else that makes its way into the dog’s ear to have a cozy new home. This is why it is especially important to this breed to clean their ears weekly, removing excess wax and any trapped bacteria, as it helps prevent possible ear infections. It is also important to clip a dog’s nails before they get to be too long. When a dog’s nails are too long, they can start to be uncomfortable, as they may start digging into the dog’s paws. To prevent this discomfort, owners will often clip their dog’s nails about every 2-3 weeks. A good way to tell when a dog’s nails are too long is by listening to them clicking against the ground as the dog moves. If you hear clicking, it’s probably about time to break out the clippers. An often neglected part of owning a dog is dental care. It’s just as important to brush a dog’s teeth regularly as it is to get them in for a regular vet visit. While you might not do too much to the dog’s breath, unless you brush their teeth daily, regular brushing will remove plaque, prevent tartar buildup, and prevent bacteria from forming infections in their mouth. It’s recommended that they have their teeth brushed at least 2-3 times a week. As you could probably imagine, a dog as small as the Basset Hound is not much regarding security. While they may get to be somewhat large, they are not tough dogs, and could not fend off an intruder if they had to. This is, of course, if the dog would even attempt to do so. There’s a good chance that these hounds would greet and intruder, after barking or howling them down at least. While they couldn’t fend off an intruder, they could easily alert you to one’s presence. Basset Hounds tend to be fairly vocal, and they won’t make an exception for someone intruding on the property. They noses alert them to different scents as well, making them even more wary. The only tricky part of the dog’s vocal personality is that it is without discretion, so they’ll alert you to anything that seems off to them. Other than their natural wariness towards anything unusual, these dogs do not have good protective qualities. They prefer to relax and lie in the sun rather than patrol the property. Their laid back personalities do not make for good guard dogs, and people should definitely look elsewhere for protection. Dogs are like people, they get sick. If you're planning on getting a dog, you have to be ready for any possible health issues down the road. Most dogs are fairly healthy, although, certain breeds are prone to certain health problems than others. It is always important when purchasing a purebred breed to make sure that you are getting it from a good breeder. A reputable breeder should know a lot about the breed, and be able to pass health checks for their dogs. Fred Basset, a syndicated Comic Strip appearing in newspapers since 1963. Sherlock is the name of the Basset Hound to which Elvis Presley sang “Hound Dog” on the July 1, 1956 episode of “The Steve Allen Show”. Pokie, a Basset Hound was friend to Lassie in some of the earlier television episodes.